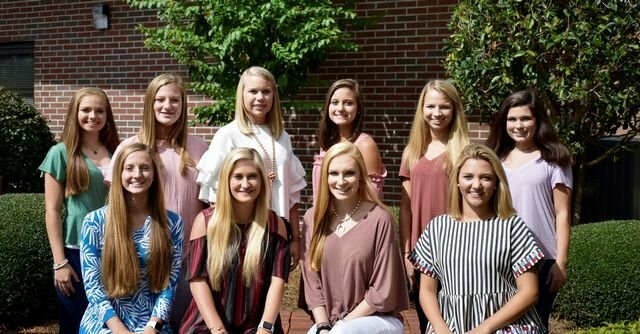 (Front Row) Senior Representatives: Sydney Payne, Kara Hubbard, Calyn Fort and Mary Catherine Dean; (Back Row) Freshman Representatives: Samantha Wojnar and Ansley Weldon; Sophomore Representatives: Maddie Crisp and Alli Dent; Junior Representatives: Maddy Copeland and Emma Griffin. Southland Academy's homecoming football game will be played on Friday, September 21st at 7:00 p.m. against The Heritage School Hawks. The homecoming court will be presented and the queen will be crowned during the halftime presentation. A dance will follow the game in the Melvin T. Kinslow Gymnatorium. We welcome everyone to come out and support our Raiders.